This is it, the girls room makeover is complete! My granddaughters are only 3 and 4, but they know what they like, and they like it. In fact, they like it quite a lot! More important, this has become a room that is complete, decorated and welcoming to any guests! I do love styling kid’s rooms because you can have so much fun with them, going a little “over the top”. In the past couple of weeks I showed you how I made headboards with hollow core doors and my no-sew dust ruffles for this room, but today I wanted to share the entire look together! Do your projects also look like this when you are in the middle of them? 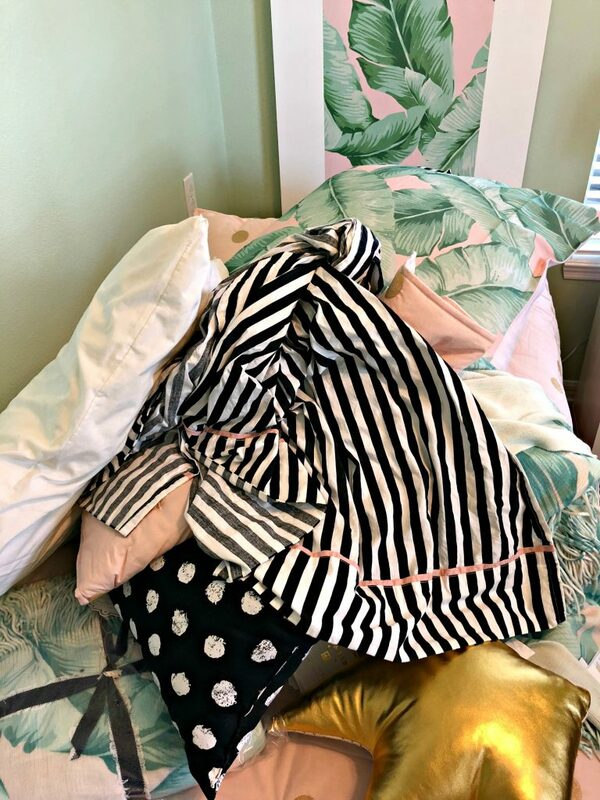 Here are all of the fun linens piled on one of the twin beds, waiting to be ironed, steamed or just unwrapped and have the chance to dress up the beds. 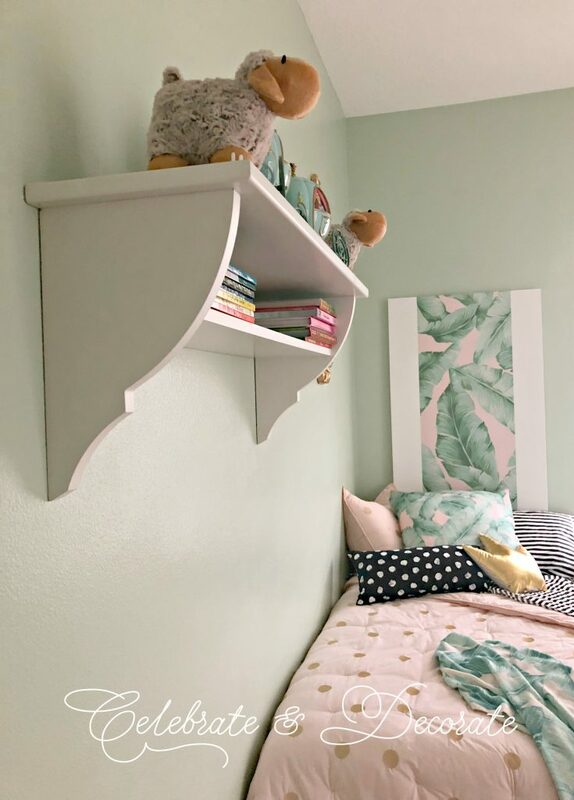 This room was a very light blue when it was a Nautical Nursery but it got a fresh coat of paint, the color is Irish Spring by Benjamin Moore. The white shelf was an online bargain I bought back when I turned the room into a nursery. The shelf is very sturdy and very heavy but attached securely to the wall should little monkeys think they can hang on it! 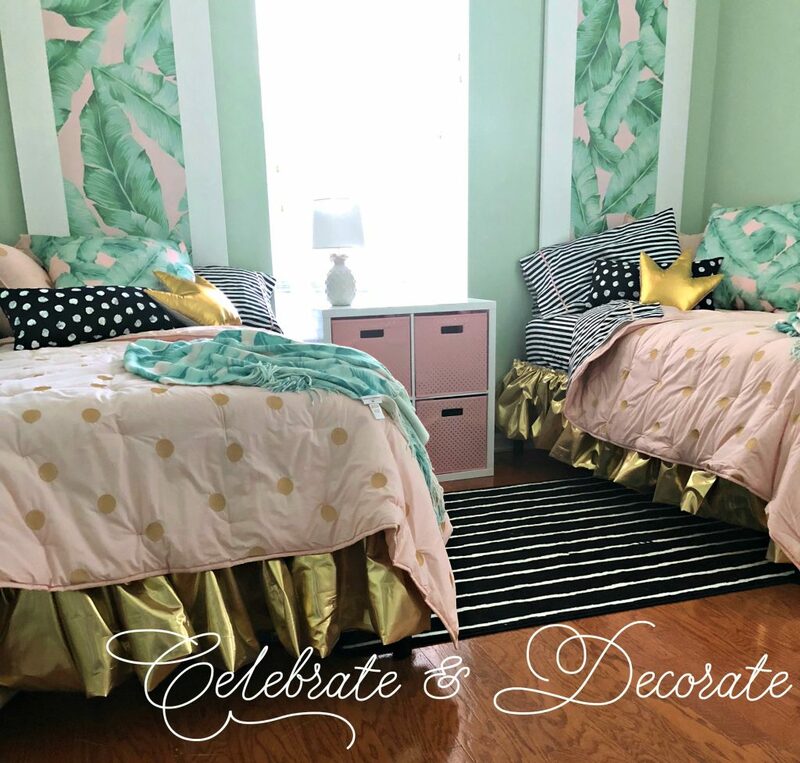 Linens from Pottery Barn Teen were the inspiration for this girls room makeover. Instead of staying all pastels, I liked the addition of black and white and a pop of gold. This is a room these girls can be happy with for years and years and won’t feel “babyish”. This was a photo taken before the dust ruffles when on. This is a small bedroom, but as a guest room, it is more than adequate. The cubbies between the beds serve as toy storage. The cubbies are pink with gold dots, from Target’s Pillowfort collection, a perfect mix with the gold-dot bedspreads. 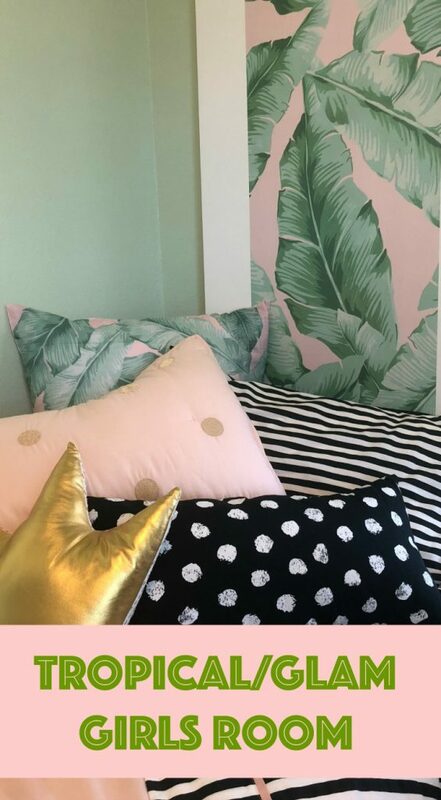 The gold crown pillows came from Target and the black and white pillows and rug came from Ikea. The rest of the linens are all from the Emily & Meritt collection from Pottery Barn Teen. The little white pineapple lamp was relocated from my office. 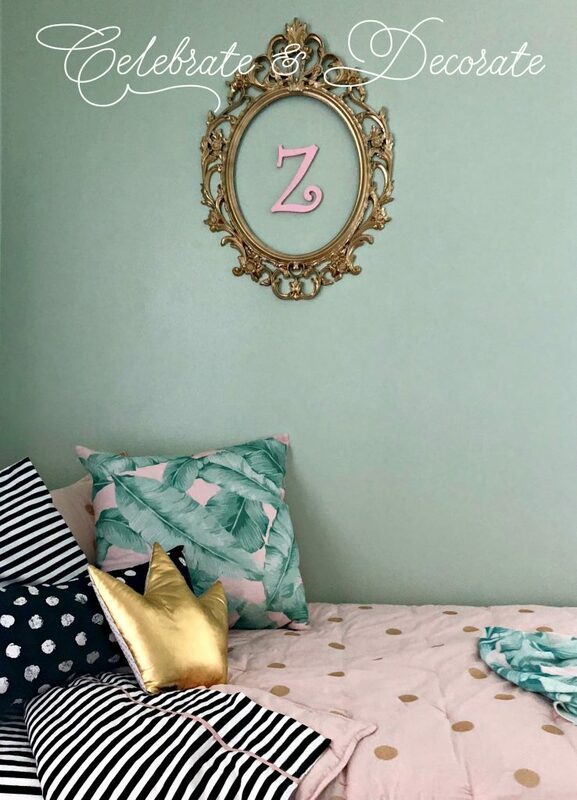 Each girl has a gold frame featuring their initial in pink above their bed. These are those fun Ikea frames I use all of the time! You can’t beat the price! 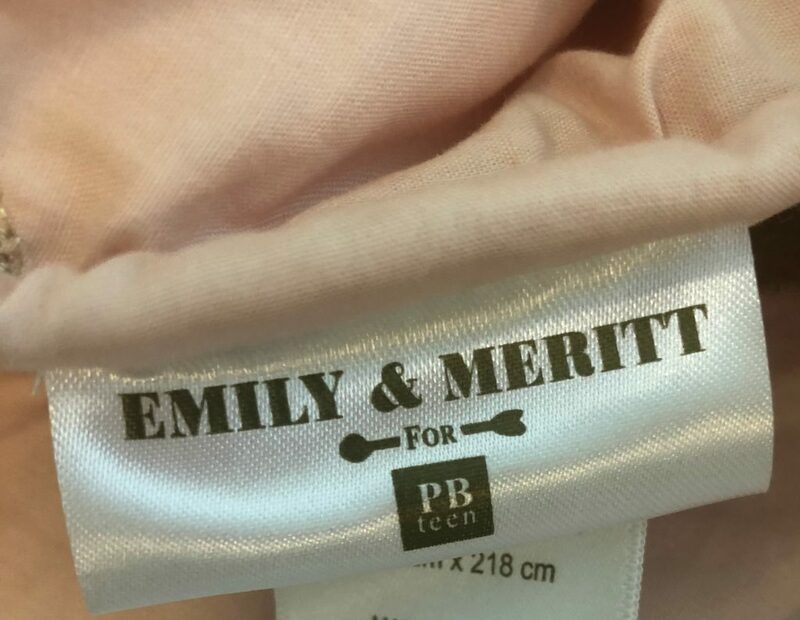 If you are looking for fun and stylish linens, I can’t say enough good about the Emily & Meritt collection at Pottery Barn!! 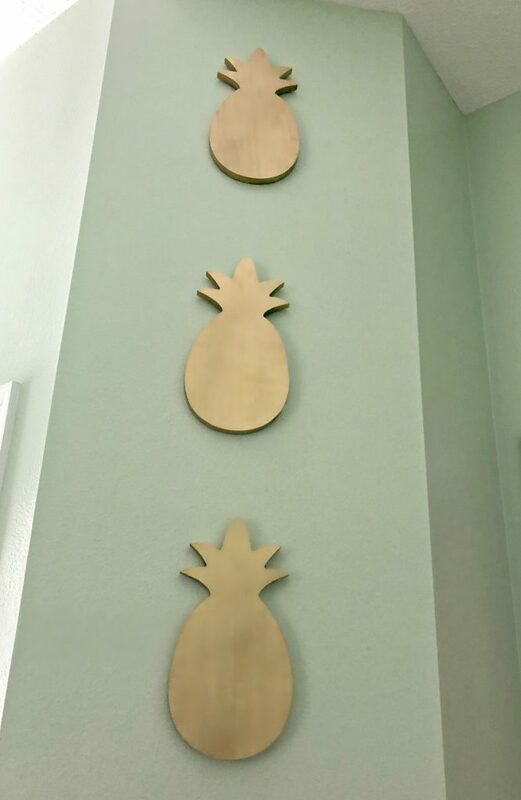 One of the simplest additions to the room is this trio of golden pineapples. These were so easy, and a bargain! I spotted these wooden pineapples that I think were supposed to be cutting boards in Spot’s Playground at Target for $3 each! A little gold paint dressed them right up! 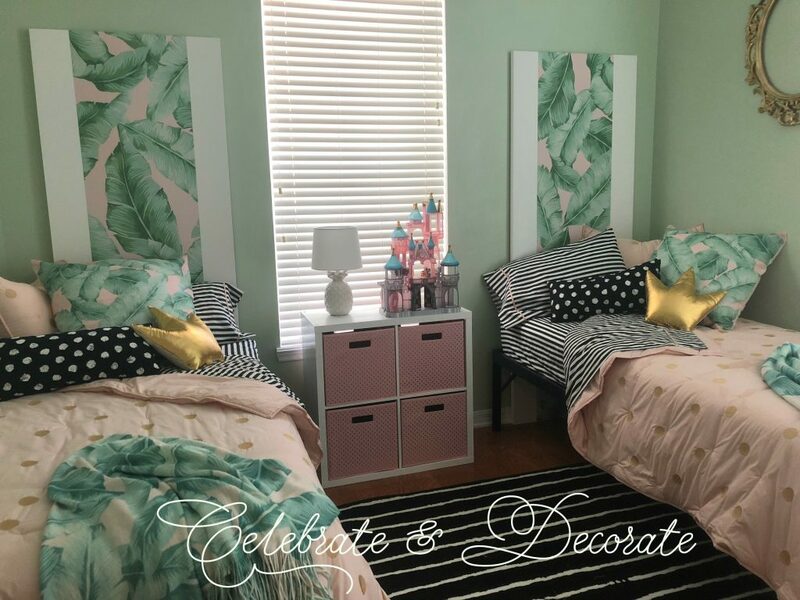 This girls room makeover is a success and these girls are so happy with their new digs! So cute and different Chloe! Love the touches of glam! PB teen has great stuff, and your headboards are so clever…I know the girls must be thrilled with their big girl room! Thank you Jenna! I am so glad to have the room complete and now am just enjoying time with these busy little girls! So cute Chloe! Lucky grandaughters. As much as I love the palm print, I like how you mixed in the black and white too. Thank you Debbee! I usually have trouble mixing prints and patterns, but felt like I got it right this time! Chloe, I love the granddaughters’ room. It is cute and glam at the same time. You were smart to decorate it to last for the years to come. I know the littles are loving it! Thank you Pam! I am sure it will be suitable for visits for years to come! You get an A+ for the decor in this room Chloe and I am sure your little girls love it all. I like the juxtaposition of the tropical and the contemporary….not too much, but just right. Thank you Kari! I usually have trouble mixing prints and patterns, but was really happy with how I pulled this one together. HUGS! Your room looks great. I know the girls will enjoy it. Bet they feel very special. Thank you Bonnie! The girls are loving their very “grown up” room! Another job well done. You have created a space where your princesses will have loads of fun ; and will be able to enjoy for years to come. Thank you Edmee! The girls are loving it! Hi Chloe! What a makeover of their room! It’s beautiful and I love all your creative touches. 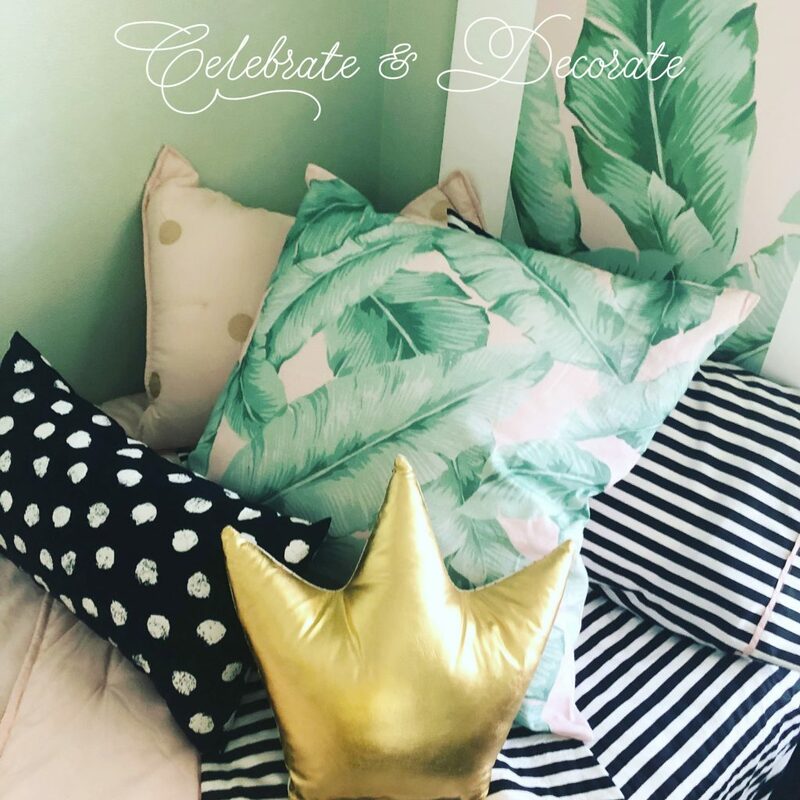 The palm print and the gold is the bomb…. the girls must live it! With a beautiful room like this, I bet it’s easy to get them into bed. Your hard work paid off big time Chloe.